Priced To Sell, Lowest Price In The Area!!! It Looks Amazing: Show It With Confidence! 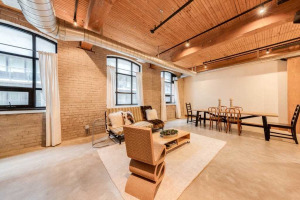 2 Bedr , 2 Baths Boutique Condo Streetcar Building In Trendy Leslieville! South Facing Unit Featuring Hardwood Floors Throughout, 9' Exposed Concrete Ceilings,Floor To Ceiling Windows And W/O To Balcony Overlooking Quiet Treed Setting, Upgraded Kitchen Cabinets, Integrated S/S Fridge, Stove And Dishwasher, Under-Mount Sink, Quarz Counter. One Parking And Locker/Storage.